16th Feb 2016 – Maisons Marques et Domaines is delighted to announce that the company is now distributing Roederer Estate’s still wines, Domaine Anderson and Carpe Diem, in the UK. 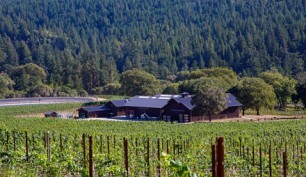 Domaine Anderson is located in the north of California, benefiting from the cooling effect of the Pacific coast, offering the perfect conditions for the cultivation of Pinot Noir and Chardonnay grapes. The winery and the vineyards, originally belonging to the Dach family, were bought by Champagne Louis Roederer in 2011, with additional vines being planted in carefully selected areas. Today, 50 acres of vineyards located throughout the Anderson Valley in the warmer northern town of Boonville right down to the cooler regions by the Mendocino coast, produce grapes for the Domaine Anderson wines which are made using 100% Estate grown fruit. The Carpe Diem range is made by Domaine’s Anderson’s winemaker, Jerry Murray, and uses 90% of Estate fruit from the north of the Valley, where the cooling coastal climate provides the ideal location for the Chardonnay and Pinot Noir grapes. The complete MMD Californian range, including Quartet and Quartet Rose, will be available for tasting at the Go West! Californian tasting on 10th March at the QEII Conference Centre. For more information on the wines, please contact Marinel FitzSimons on 020 88 123380 or marinel.fitzsimons@mmdltd.co.uk.